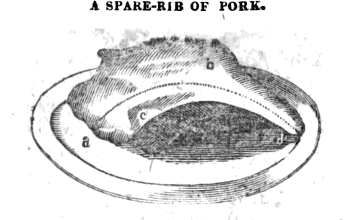 Instructions on how to butcher, cook and carve a spare rib of pork from an 1831 Cincinnati cookbook is below. During this time, the city contained large hog packing operations, shipping the meat to the eastern markets. Unlike the previous post on medieval cats, HERE, the cats in these paintings are more active. In fact, the first painting is filled with activity: 'Cats fighting in a larder' by Paul de Vos (1663, at The Prado). 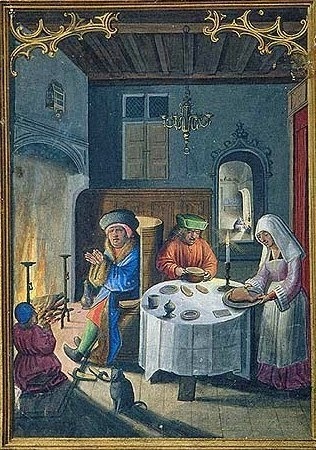 The still life includes asparagus, artichoke and... small birds strung on a stick. Click images to enlarge. In the early 1900s workers were given a metal token token or "check" for a set number of baskets filled with fruit or vegetables at "truck" farms. Also for oysters shucked. The discs were redeemed for merchandise at area stores or for cash.